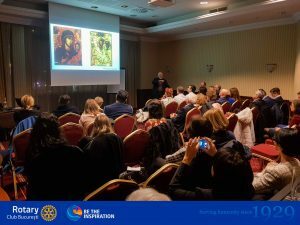 Welcome to Rotary Bucharest website! We are a community of people with different fields of activity, ages, and interests, but united by the vision of a better Romania, in a better world, and characterized by sharing of the same fundemental values. We are a group of friends with a common mission: To Serve! Rotary is a worldwide organization of business and professional leaders, that provides humanitarian services, encourages high ethical standards in all areas of activity and helps build goodwill and peace in the world. Our objective: encouraging and supporting the ideal ”to serve” as a basis for valuable actions. 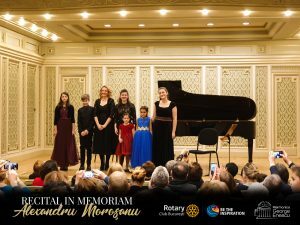 Saturday, February 9, 2019, the exceptional recital was held in memory of our colleague and friend Alexandru Morosanu. 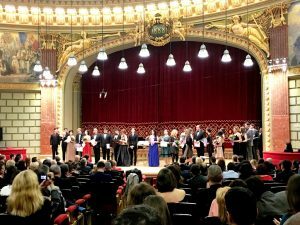 The event was hosted by our colleague Mădălina Pasol and young performers: Medea Moraras, Noa Suma, Sasha Samfira, Carla Ungureanu, Iarina Teodorescu, Sofia Blându. 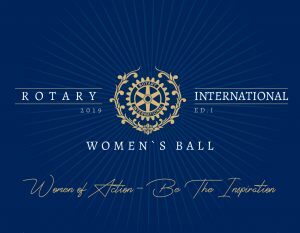 Rotary International Women’s Ball is an opportunity to support mothers and newborns, recognize the Rotarian’s potential to have a positive impact on the community and celebrate Rotary International woman. Our Club once again had the pleasure and honor of listening to our colleague, Prof. Dr. Bogdan Miron, at the “The Multiple Significance of Religious Icons” Conference.